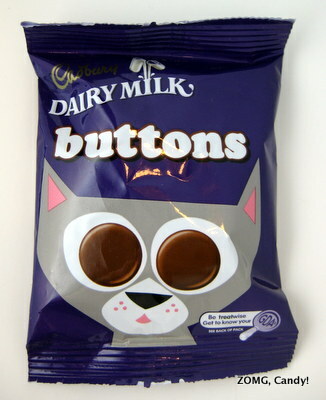 These British Cadbury Dairy Milk Buttons were a surprise international treat in the free sample MunchPak that I received a while ago and am still slowly munching my way through. The buttons were little thumbnail-sized disks with a flat side and a domed side. Their flat side had the scripted Cadbury logo imprinted on it. They were the perfect size and shape to slip onto my tongue and smash against the roof of my mouth. 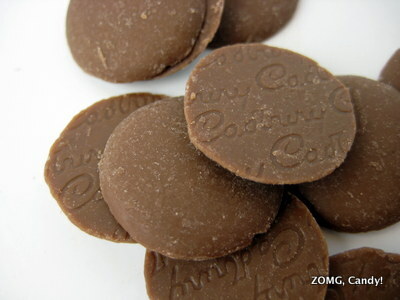 Doing so caused the buttons to dissolve into a tongue-coatingly thick and creamy puddle of milk chocolate. 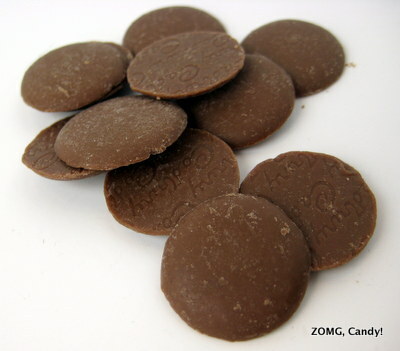 The Cadbury’s milk chocolate was quite sweet, with dusky caramel flavors amidst the cocoa. As far as mass-produced milk chocolate goes, I much prefer Cadbury’s to the sour milk tinge of Hershey’s. The buttons were a fun diversion that were well-sized for slow savoring. An O because I probably wouldn’t buy them for a snack – there are better milk chocolates out there, especially if you’re willing to spend an extra buck or two – but I wouldn’t turn them down if they were offered to me for free.